Share your files. Anytime. Anywhere. Gain access to all your movie files – anytime & from anywhere! Listen to your favorite music from anywhere you want! Share your files with your friends – fast & secure. Now with Up- und Downloads in Super-Highspeed! Uploaded.to is the worldwide industry leading One-Click-Filehoster with best of its class premium features. All users can choose between a free account, which offes a limited feature-set and a featured out Uploaded Premium Account. With the Premium Account you get access to all of the innovative features, such as instant and ad-free access to the file-downloader, which offers unlimited parallel up- and download speeds. When purchasing a Premium Account, you will get so called Premium Points. You can use these Points to extend your Uploaded Account – free of extra charge. In order to extend your Membership for an extra month, you need the amount of 10.000 Premium Points. 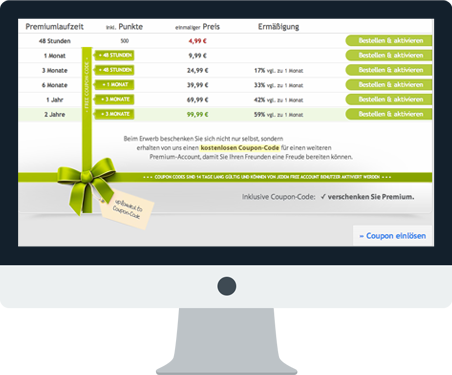 You can also earn extra Points through our Affiliate Programm. 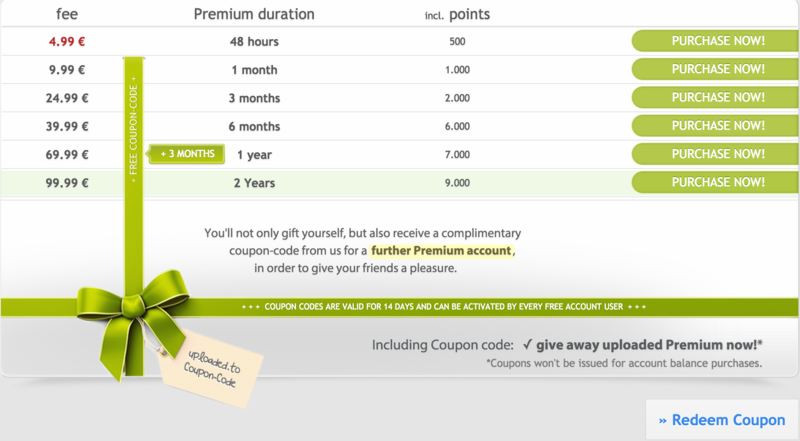 We will also gift you a coupon for an extra free month of premium membership! You can utilize it in order to extend your own membership or you make a beloved one a super nice present and give it away – its up to you! Get a free Premium Coupon when purchasing an Uploaded.to Premium Account! As a Premium User you gain access to Uploadeds Remote-Uploader, which enables you to transfer all the files which you might be hosting on other File-Hosters in no time at speeds up to 100MB/second on to your new Uploaded Premium Account – fast and reliable. Another great feature is the unlimited storage of your uploaded files. Our system makes sure that all your files are safe – now and in the future and thanks to our trusty file-manager you’ll always have the perfect overview over all of your files. Wanna make an extra buck with your files? No problem – simply join our affiliate programm! With our new Uploaded.net Android app you can now use all of our premium features when you are out on the road – anytime and from anywhere! It doesn’t matter if you’re currently on a free account or if you already have the fully featured premium membership, you get full access through the app. Gain full access to your files through your smartphone and trigger up- and downloads while you are out and about. Need access to your pictures, movies or that one piece of music you want to show around? No problem – with our app you gain access from anywhere at anytime. Want to have a quick look at your affiliate stats? You can do that too, all in the app. The app is now available through the Google Play Store. Get your Uploaded Premium membership for instant & ad-free filesharing.